Bismillah Khan (Urdu: استاد بسم اللہ خان صاحب‎; March 21, 1916 – August 21, 2006) was a legendary Indian musician of the wind instrument the Shehnai which he popularized and brought it to a pinnacle of glory and for which he got the honorific Ustad prefixed to his name. The Shehnai, which was a folk instrument played primarily during traditional ceremonies was elevated to the status of playing solo on the concert stage. During his life time he was one of the few artists who received all the four Padma awards, and topped with the India’s highest civilian honour, the Bharat Ratna, in 2001. He was a pious Shi'ite Muslim, but an Indian devotee of Saraswati, the Hindu Goddess of wisdom and arts. He often played at Hindu temples, including the famous Vishwanath Temple in Varanasi on the banks of the river Ganga. Even if the world ends, the Music will still survive....Music has no caste. Quoted in Ekbal, Nikhat (2009). Great Muslims of undivided India. Gyan Publishing House. pp. 45–. ISBN 978-81-7835-756-0. Along with the steady diet sitar, sarod, and tabla, several new instruments and players came to my attention. The first of these was Ustad Bismillah Khan, master of the sonorous double-reed instrument known as shehnai. This beautiful wind instrument, with finger holes and a bell-shaped opening at the bottom, sounded to me like a hybrid of soprano saxophone and oboe, and Bismillah Khan’s tone very much influenced what Coltrane and Terry Riley would do with the soprano sax. 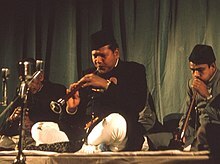 Primarily used at weddings, the shehnai had been rejected as a classical instrument until Bismillah Khan elevated it to a higher status among listeners. His unique fingertips and sublime breath control produced the necessary range of sounds for raga making shehnai one of the more popular instruments in North India. Peter Lavezzoli in his bo Lavezzoli, Peter (24 April 2006). The Dawn of Indian Music in the West. Continuum. p. 32. ISBN 978-0-8264-1815-9. Raj Kumar in Kumar, Raj (1 January 2003). Essays on Indian Music. Discovery Publishing House. pp. 205–. ISBN 978-81-7141-719-3. Above two quotes by Ranjana Srivastava, Dean, Faculty of Performing Arts, Banaras Hindu University cited in "Ustad Bismillah Khan dies, aged 90". The Hindu. 22 August 2006. Retrieved on 10 December 2013. This page was last edited on 21 March 2018, at 07:03.